Blackinton B38 Eagle Badge - B38 - 2 9/16" x 1 9/16"
Home > Blackinton > Police Badges > Badges with Eagles > B38 Eagle Badge - B38 - 2 9/16" x 1 9/16"
B38 Eagle Badge - B38 - 2 9/16" x 1 9/16"
Blackinton badges are the first choice for law enforcement or anyone working in an official capacity. This badge has an eagle perched on top and measures 2 9/16" x 1 9/16". It features the fine detail only Blackinton can offer. This model is style #B38 and it can be customized to fit your exact needs. The top scroll, ring panel, and bottom tab give you up to four lines of text for the information of your rank and department. 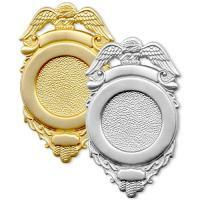 Wear your badge with pride knowing it is made to last right here in the USA! Dimensions: 2 9/16" x 1 9/16"
©2002-2019 CopsPlus.com: Blackinton B38 Eagle Badge - B38 - 2 9/16" x 1 9/16"